After raising my hopes with fast 4G Broadband speed decoupled from my phone’s hard line, new company Relish failed to deliver their much-touted high speed service thanks to repeated dropout and an upload speed at less than a quarter of the level they’d promised, so the box went back. I love technology, but it’s only as good as the uses you find for it. This is why I have trouble with SF movies that beam people to other planets. Everything would probably end up like Joe Haldeman’s ‘Forever War’, where soldiers routinely lose limbs or die in the imperfect matter-transportation process. Even crime shows, in which detectives snap ‘enlarge that’ and ‘run a check on this’, now seem unlikely as they’d actually be complaining about missing files and blurred images. The NHS’s disastrous switch to a computerised patient-file system resulted in doctors returning to paper folders after the computer company underestimated what was required. The path of technology is littered with failures because unlike mechanical innovation, which bedded in over decades of trial and error, it operates on a much narrower R&D margin that needs products to hit the street soon after invention. Even so, computerisation took more than thirty years to truly arrive. 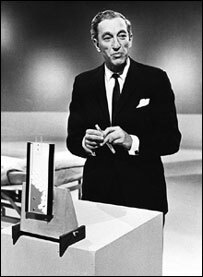 The TV show ‘Tomorrow’s World’ always promised astounding technological changes in the very near future, but to my knowledge they never did follow-up shows to explain what had happened to the tech that never made it. While there have been incredible advances in medicine and science, we’ve downscaled fantasies about colonising other planets – perhaps the best we can hope for is a decent signal on our mobiles. Watching ‘The Edge of Tomorrow’, Tom Cruise’s ‘Groundhog Day Meets Starship Troopers’ movie, felt as if we were stuck in a tech-past that had failed to move on, all holograms and exoskeletons, and WW2 images of being dropped from planes, an awkward mash-up of mechanics and computers. Where were the drones of real modern warfare? 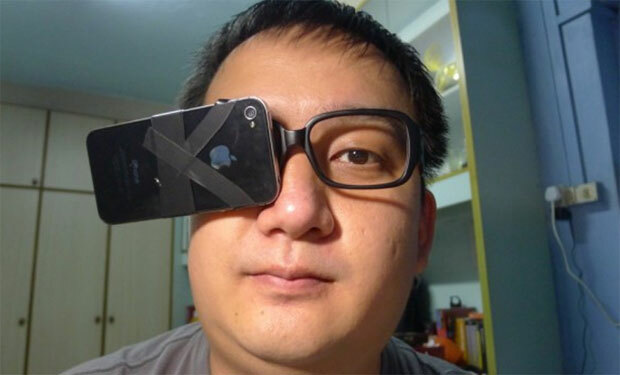 The most recent real-life innovation, Google Glass, is already looking as if it will be unlikely to catch on, at least in its present form. And remember when Michael Crichton got all excited about nanotech? What happened to that? We’re still having trouble keeping MRSA out of hospitals. Oh, there’s a lot of excitement about 3D printing, but when the first thing someone makes is a gun, you have to worry for its future. The health-wristband craze (I took mine off after six weeks because I managed to lose the charger) found a slender market in a health/tech crossover section, and I wonder whether an Apple watch will go the same way – do we really want to go back to strapping things around our wrists? But the oddest side effect of monitoring-tech has been to turn watches and fountain pens and cufflinks into luxury items as absurd as Faberge eggs, presumably the bling choice of Russian gangsters. Open any glossy magazine (they still have such things as nobody has quite cracked online mags) and the pages are full of them. The real breakthroughs are invisible – safety and health equipment improvements we don’t even notice in our lives. Feel free to play devil’s advocate here (as if I could stop you). I too love gadgets but you should expect most to not live up to expectations in their first few incarnations and some will just be brain dead at birth. Others will simply shine briefly and disappear. The first home computers were gadgets (some) people flocked to. Yet their usage was pretty limited. The Spectrum and C64 tried to do “real world” stuff but never got much beyond a spot of gaming. The first PCs really only replaced the typewriter. In 10 years time will the smartphone resemble the smartphone of today? Will we still have tablets or PCs? Will we need a watch or glasses that connects to everything? I don’t know. I do anticipate that things will have changed. I expect that network communications will be much improved. As a young author, you probably would not have considered that a major mode of distribution of your would be done in non-paper format. After all paper books have been around for hundreds of years and yet (in terms of history) all of a sudden you have widespread adoption of ebooks and the rate of growth indicates that these will surpass paper books in a very short timeframe. By their nature people will invent new stuff and invent them with increased rapidity. Not all will be successful or useful and some will take time to reach a point where they become widely adopted. The flip side of the gadget world might be, that it is moving too fast for us to keep pace with. Especially in terms of legislation and the ethics involved. Some gadgets seem to look for a reason to exist rather than exist because of a need. You can, however, rejoice in the fact that you are able to use gadgets to live the lifestyle you have and not be required to lug around an Underwood, loads of paper and carbon to carry out your work! Actually I was thinking of buying an Underwood after seeing a great photograph of Dino Buzzati from the 1940s. He’s sitting in an Italian cream suit with an Underwood on his knees, typing. And he’s smoking. Michael Crichton and my brother were roommates at Harvard and Crichton always had a huge interest in medicine, gadgets, and nanotech. He apparently had an original and inventive mind for what could be done with miniatures and the human body, so much so that my brother wanted and urged him to specialize in the field, not fiction. But Crichton found writing was less work, more rewarding, and threw over medicine for the inventive potboiler. This caused their friendship to founder and my brother to feel ever afterwards that a lot of technological advances were shelved for the sake of writing fiction and cash. Toward the end of his life, Michael may have somewhat agreed with my bother. (Might have been nice to have had it both ways though.) My brother became an anthropologist specializing original research on the history and cultures of the islands of the mid-Pacific, so he went for research not cash. His books are a lot harder to read than Michael’s. Perhaps, it all sort of evened out. Personally I let my children handle technology. I understand more than I let them know they just have more patience than I do. After reading a review in the Atlanta Journal Constitution last fall, I started at the series beginning and am up to book #8. Just wanted to say thank you! I still use a fountain pen and am on first name terms with the staff at the Vancouver Pen Shop. Pens and cuff links are not yet luxury items except in so far as there have always been luxury versions. Ken even bought a new pair of cufflinks on our recent trip and has several French cuffed shirts with which to wear them. You don’t have to use those expensive cartridges, either. The Lamy pens (very good & reasonable) come with a reservoir to use in cleaning out a previous colour of ink, but most people use it to hold ink from a bottle. I have Black Cherry, Violet, several shades of blue, seashore gold, and several others, including London Fog. ‘Tomorrow’s World’ was great fun, we only really watched it just to see something fail to work or blow up live. But it was too cutting edge, by the time the technology did appear we had forgotten they had shown it to us. My Grandfather gave me an antique crystal radio – his first radio – to use, not “play with” – anybody remember them? A clear, somewhat rough crystal mounted in position inside a fine wooden box, with a armature holding a thin copper wire probe and two output posts with screw down bolts to attach wires to. A pair of head phones, or a resonant fruit bowl to amplify the faint sounds coming from the headphones. Batteries on the side, don’t bust the hand painted bowl. You carefully probed about the uneven surface of the crystal until you “caught” a radio wave passing through the crystal and then using the headphones you could hear a radio broadcast; or you could set the headphones in the fruit bowl and crank up the gain until the bowl amplified the headphones’ sound so all at the table could hear. It took a lot of careful probing and calibrating, but worked – early radio reception. Not at all an iPad, but a rig that forecast the coming of the media we have now. And the stereopticons with their twin, slightly offset photo cards, that gave you 3D. All early evolutionary models of today’s must-have pocket stuffers. Not a white charging wire in sight, nor an iTunes store. There’s a short story in there somewhere, if a random Mobius strip effect were introduced. I have a 1960’s radio. Beautiful sound and and design. I wanted it to be used in the office. But no. Health and safety rules. Those that hanker after the feel of typewriter, but are wedded to new tech, can have it both ways. There are kits available to convert the former to usb, for about £30. Or they can be bought ready converted. Alan, provided that the radio was in decent condition inc. the flex*, I can’t see any reason why it should be banned. If it passes a PAT test, the Elf and Spoilsport mob can’t have anything to complain about. Radio in great shape (Hell – I use it at home and have some sense of self-preservation left!). But the goblins just said no. Would not even PAT test it. No. Some people have no imagination or sense of humour or anything, Alan. Insist they test it. What’s the matter with them? Or even better you can still buy crystal radio kits. Set one up with the antenna wire up the outside wall and the ground attached to a drainpipe. Bring in the fruit bowl (we never tried that) and Bob’s your uncle – or Jane’s your aunt as a friend of mine says. I think new technology is great, I could idly not spend a fortune on it all day. Phones that seem constantly to be discarded for the slightly next one, laptops that aren’t meant to work beyond Tuesday. Hey, buy them – all good by me. It’s the fanatics that tickle my trouble bone though, and some Apple fans are the worst for this. It’s not enough that some buy all and everything and new and all the time but unless everyone else does or admits how wrong they are for not then that’s not right. Both my grandads could strip and mend cars and neither of them was a mechanic. My dad built his first radio. I can strip and clean a Rotring pen. Man, I’m crap. I know, I know, I’m just forty-five and I’m already just so old. I want stuff to last. I don’t want 10,000 books because it says so on a little screen, You don’t truly own a book until you’ve read it. Or in my case loved, creased it, dropped in the bath, killed a troublesome fly with it, and if good lost it having leant it. Here, you own a sports car, it says so on this bit of paper, it’s in the garage, you are never to go in the garage. Bring on the tech. Bring on the tech that works and does what it says. And if it doesn’t then all power to anyone that buys it. Just don’t insist everyone else does.